Our film documentary and performance of Mozart’s glorious Kegelstatt Trio (clarinet, viola, piano) explores historical performance practice and gives insight into our rehearsal methods. 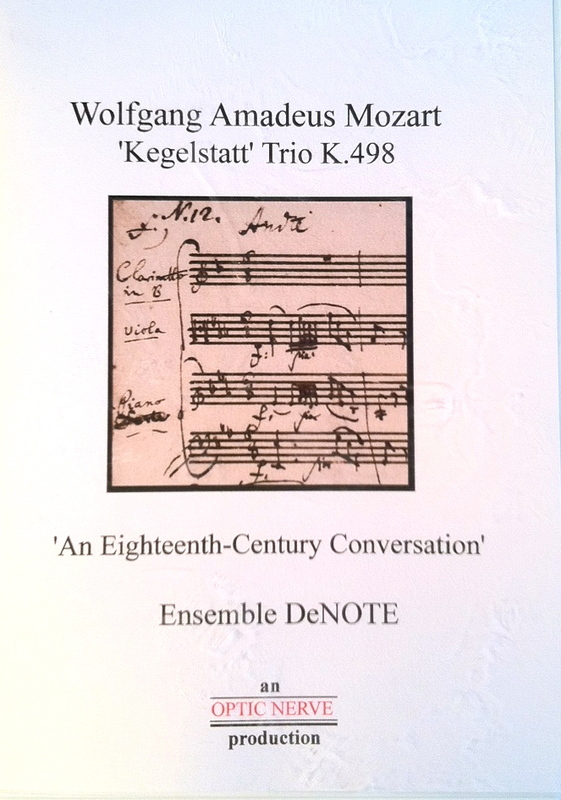 Recorded at Finchcocks, Wolfgang Amadeus Mozart, “Kegelstatt” Trio, K.498: An Eighteenth-Century Conversation is available worldwide on the iTunesU platform, and has had well over 40,000 views. It has also been released as a DVD from OpticNerve Productions. 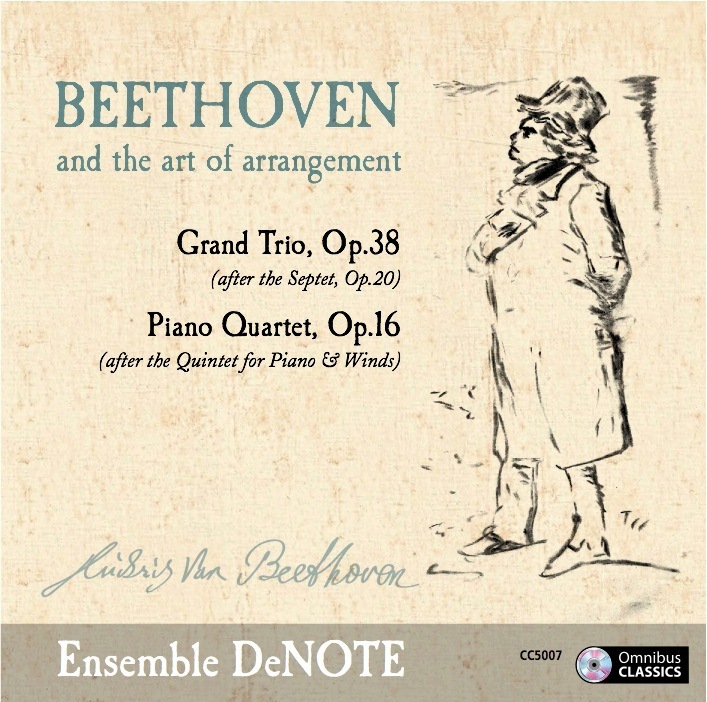 DeNOTE’s CD, Beethoven and the art of Arrangement (OMNIBUS Classics CC5007) epitomises another central aspect of our work: exploring some rarely-heard nineteenth-century arrangements of familiar classical repertoire for unfamiliar forces and instrumental combinations. Beethoven’s own arrangements of his ever-popular Septet and the Quintet for Piano & Winds are combined here for the first time in recordings on period instruments. Click on the link below to listen to excerpts from Ensemble DeNOTE’s recent Beethoven CD on Soundcloud. (You may need to set up a Soundcloud account first.) The CD was released in May 2015 on OMNIBUS Classics (CC5007). Ensemble DeNOTE features in several films recorded specially for inclusion in The Mozart Project – the 5* internationally best-selling interactive book on Mozart for iPad. Available on the iTunes Store, The Mozart Project was described by Stephen Fry as ‘a completely new kind of book…an amazing achievement’. Among The Mozart Project’s key authors and performers is DeNOTE’s John Irving who wrote several chapters and appears in a number of video and audio recordings within it. We explore three of Mozart’s chamber works for fortepiano and strings in The Mozart Project: the G minor Piano Quartet, K.478; the Piano Concerto in F, K.413 (in the composer’s own arrangement for piano and string quartet); and an anonymous Viennese arrangement from c.1793 of the Quintet for Piano and Winds as a Piano Quartet, K.452. The recordings were made at Winchester College in March 2013. 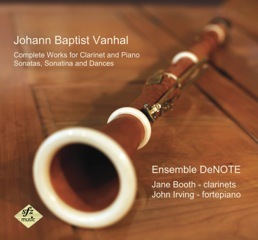 Jane Booth and John Irving explore the emergent Clarinet Duo Sonata in a disc devoted to the complete works for this combination of a much-neglected Viennese contemporary of Mozart and Haydn, Johann Baptist Vanhal (1739-1813). Vanhal performed string quartets with these two giants of Classic era chamber music, and his violin concertos were performed by Mozart. In these works for clarinet and piano dating from the first decade of the 19th century, Vanhal explores the colour combinations of these instruments with remarkable imagination and flair. Released 2013 on SFZMusic (SFZM0413).